I had a Carolina Windom antenna up for nearly 10 years before a vicious wind storm brought it down, smashed the matching transformer and cracked the line isolator. It had worked so well that I immediately went to the Radio Works site to order another one. 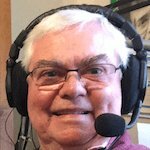 They had developed a new antenna, the Carolina Windom® 160 Special ... that would fit in the same horizontal space that my CW-80 used to fit in. I would now have access to all HF bands 160-10 meters with an antenna type that had exceeded my expectations for years. Needless to say that I immediately ordered one. Pre-assembled top part of antenna (see text below). Vertical RG-8X radiator portion (grey coax coiled). Enough Coax Seal® to seal all connectors. An extra insulator (see manual). The horizontal wires (50 feet and 83 feet) are already assembled to the impedance matching transformer. The end insulators are also pre-installed. We are instructed to not modify the lengths of wire, as they are critical for proper antenna performance. The instruction manual is very complete and full of explanations on how and why the antenna is built the way it is. ... without the annoying QRN pickup of a standard 1/4 wave vertical! ... without the power loss in the ground/radial system! It is better than any single-band or multi-band dipole. Definitely better than any quarter wavelength vertical, no matter how good its radial network. 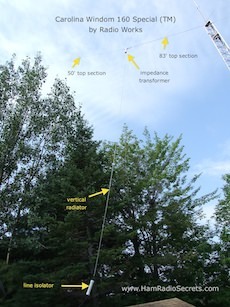 Besides, a vertical for 40, 80 and 160 means the use of traps to keep the size down to something manageable. Trap verticals do not even come close to the performance of the CW-160 Special! 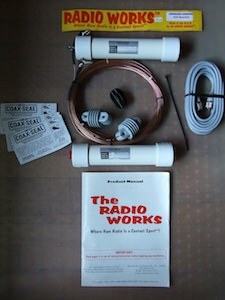 The CW-160 Special also outperforms any wire antenna - homemade or commercial - that I have tried since 1974! When I use the CW-160 Special Carolina Windom Antenna with my high-performance QS1R direct-conversion SDR receiver ... it's an unbelievable combination. Pure bliss! It has become my antenna of choice when I go QRP with my FLEX-1500 5W SDR XCVR. I get outstanding results, on any HF band!